The military strategy of the Netherlands primarily focused on operations on land, and the role of the Royal Netherlands Navy was limited to defence of coastal waters. The naval strategy was centered around defence of essential ports, estuaries and coastal areas. Defensive minefields played an important part in this defensive strategy. For this, the Royal Netherlands Navy built a number of classes, starting with the Hydra-class. These minelayers were the first purpose-built minelayers, their predecessors were converted ships. 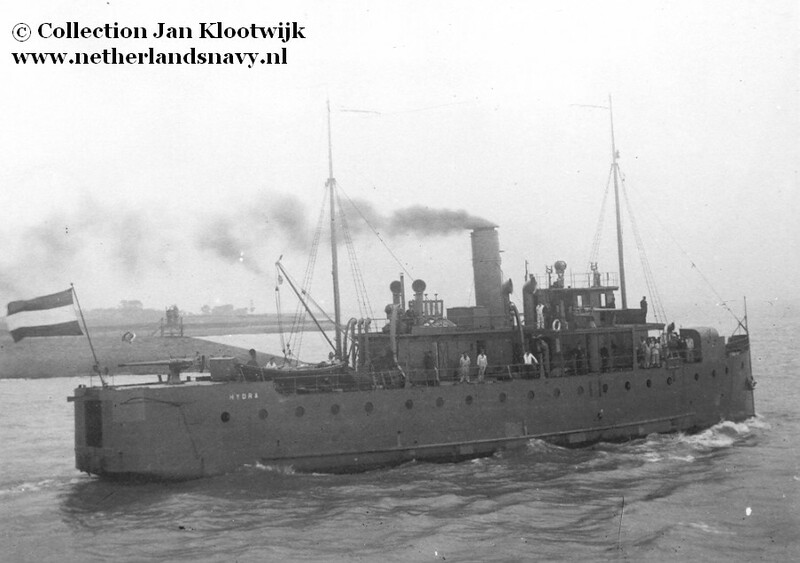 They gave good service during the neutrality period (1939-1940) in their role as minelayer, and especially Hydra was very active during the invasion of the Netherlands (May, 1940). However, this only covered up that these ships were old and did not have much fighting value left, and their subsequent careers were testimony to that. Only Medusa escaped to the United Kingdom where she was not given an active role, at a time when anything that could float and fight was pressed into service. Hydra was damaged and captured by German forces, but the Kriegsmarine did not bother to repair the ship, which was soon scrapped. Hydra at sea, date and place unknown. : Information taken from [VML] unless noted otherwise. Confirmed by other sources unless noted otherwise. : Pennants Medusa from [VAM]. Medusa was apparently not given a pennant during World War II. : Information taken from [GB110] unless noted otherwise. Confirmed by other sources unless noted otherwise. : These were originally low-angle guns converted for use against aircraft in 1922 by Bofors. Boilers 2 Yarrow boilers, license-built by N.V. Werkspoor. Range  1440 nautical miles @ 6 knots. 950 nautical miles @ 10 knots. : [VML] says 900 ihp. [CAG] and [MB36] say 800 ihp. Hydra Rammed and sunk by torpedoboat Z-3 in February, 1921. 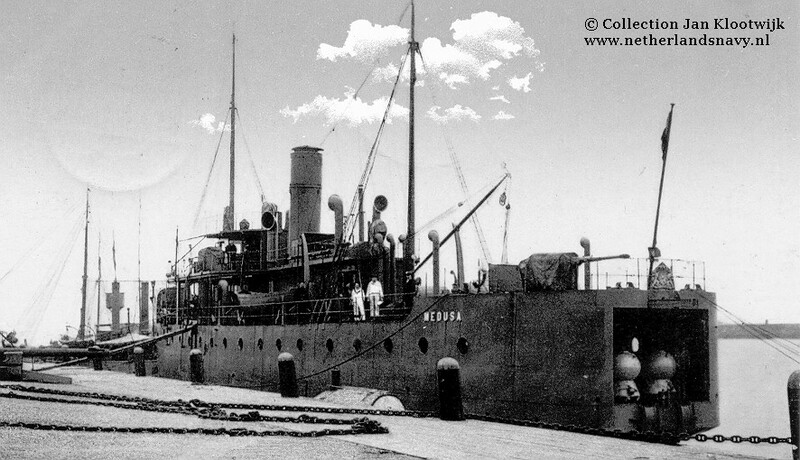 Salvaged April, 1921, returned to service 1923. 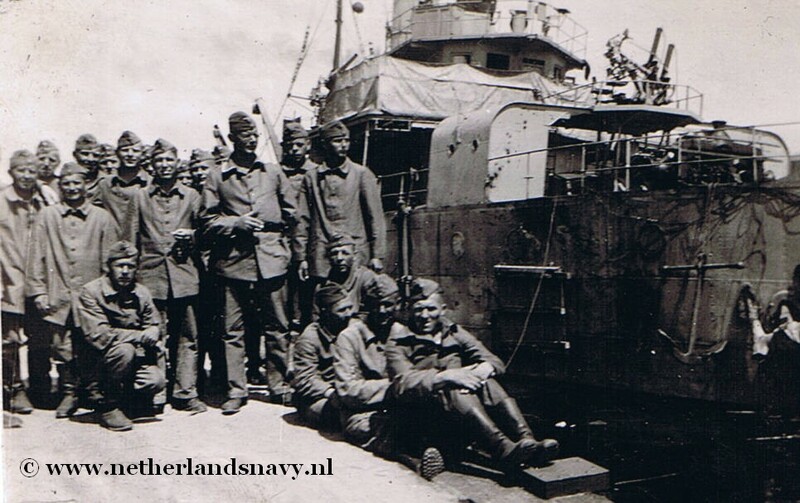 Involved in laying defensive minefields in Dutch coastal waters September 1939 - May, 1940. Claimed one German aircraft shot down in Veerse Gat, May 11, 1940.. Covered French torpedoboat L'Incomprise with anti-aircraft fire when former bombarded enemy shore positions near Waarde May 15, 1940.. Bombarded enemy shore positions on Sint Philipsland May 15, 1940..
Damaged by shore batteries from Sint Philipsland on May 15, 1940. Run aground to prevent sinking. Three crewmen killed in action..
Medusa Involved in laying defensive minefields in Dutch coastal waters September 1939 - May, 1940. Evacuated from Den Helder on May 14, 1940 with minelayers Jan van Brakel, Douwe Aukes, Nautilus and gunboat Johan Maurits van Nassau. Johan Maurits van Nassau was sunk by air attacks from German bombers. Arrived Falmouth May 26, 1940. Laid up with only crews for anti-aircraft guns with Douwe Aukes and Van Meerlant. Towed by tug Empire Henchman from Falmouth to Holyhead July 31 - August 2, 1940. Training, depot and accommodation ship at Holyhead August, 1940 - February, 1944. Transit from Holyhead to Shadwell Basin, London February 9 - 17, 1944. Returned to Netherlands January, 1946. Accommodation ship submarine service 1946 - 1950. Repair ship for minesweepers 1951. Sold for scrap September 25, 1964 to Jos Desmedt in Antwerp (Belgium). : From [GB110] unless noted otherwise. BOS1 Ph.M. Bosscher "De Koninklijke Marine in de Tweede Wereldoorlog", volume 1, published 1984. CAG M.A. Cageling "Onze strijdmacht ter zee, published 1938. GB110 GB110 (Mededelingen van de Marinestaf), volume 3, chapter 18: "De bewegingen en acties van Hr.Ms. Nautilus, Hr.Ms. Medusa, Hr.Ms. Van Meerlant, Hr.Ms. Douwe Aukes, F.S. Bouclier, Hr.Ms. Campbeltown, F.S. Notre Dame de France, F.S. Jean Frederic, Hr.Ms. Gruno." MB30 Departement van Defensie, "Jaarboek van de Koninklijke Marine 1930-1931", published 1932. MB36 Departement van Defensie, "Jaarboek van de Koninklijke Marine 1936-1937", published 1938. MAR Chris Mark "Schepen van de Koninklijke Marine in W.O. II", published 1997. VAM W.H.E. van Amstel "De schepen van de Koninklijke Marine vanaf 1945", published 1991. VML A.J. Vermeulen "De schepen van de Koninklijke Marine en die der gouvernementsmarine 1862-1962", published 1962. Hydra with Dutch soldiers posing for the photo. The photo was apparently taken during the mobilization period 1939-1940, but exact date and place is unknown. Note the twin 12.7-mm machinegun on the bow (Collection webmaster). Medusa at the quay, with mines type 1907 on the mine deck (Collection Jan Klootwijk). August 8, 2014 Updated page (all sections). July 24, 2014 New photo of Medusa added.